Engraving, roughly 8 x 5 inches (20 x 13 cm), in the collection of the Metropolitan Museum of Art. Hendrick Goltzius was a German born Dutch printmaker, draftsman and painter active in the late 16th and early 17th centuries. 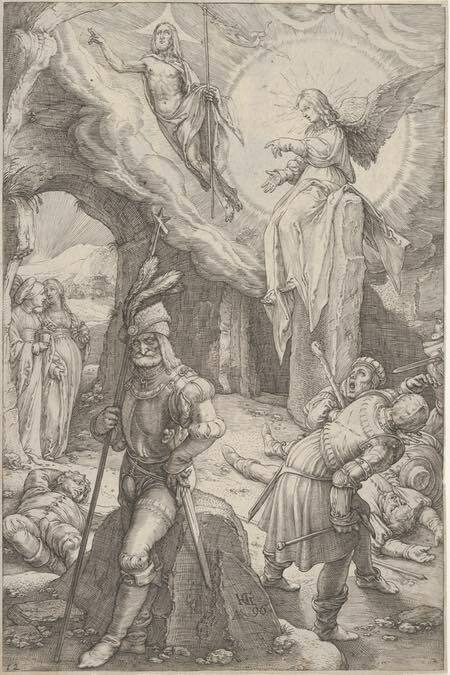 Among his other accomplishments was a folio of prints depicting The Passion of Christ, from which this is an instance of The Resurrection. Like most prints, there are multiple impressions of this one, the Met itself appears to have a second version, and there is one from the collection of the Oklahoma City Museum of Art that can be viewed i more detail on the Google Art Project. The figure of Jesus is less than prominent in the composition than the foreground figures of the soldiers guarding the tomb, the foremost of which seems almost oblivious to the events behind him. The figure looks posed, and it’s highly likely that Goltzius had a model to work from. 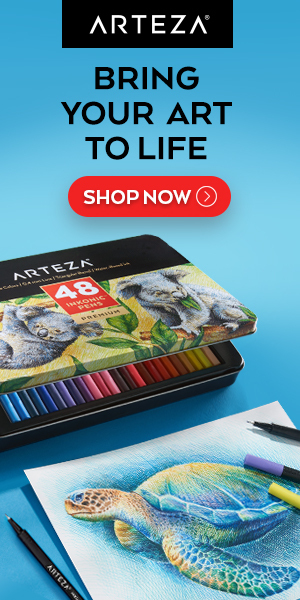 The artist’s engraving lines, though solidly placed on the foundation of his superb draftsmanship, have a casual quality more in common with etching or pen and ink than engraving. Goltzious was also an accomplished pen artist. I really admire his use of line in the depiction of drapery, particularly in the figure of the angel, and the contrast with his hatching on the stone and dirt surfaces. Two panels of a diptych, oil and gold paint on canvas, each roughly 40 x 17 inches (100 x 44 cm). The source for the images is an auction house, so I assume these are now in a privete collection. Of the two panels, that of the white grapes fares better in reproduction, revealing the artist’s nicely painterly approach and his use of texture, both in the plant forms and the background. 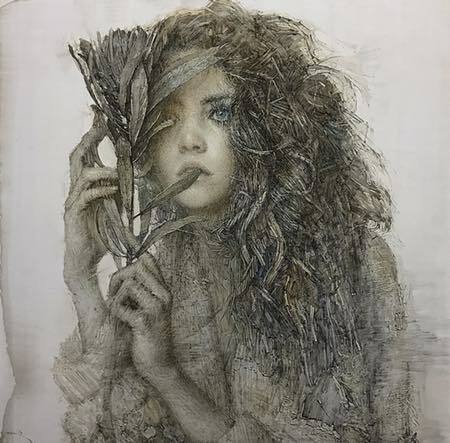 Daniel Blimes is a Los Angeles based painter whose current work is a series of portraits, faces and figures rendered in oil in a fascinatingly textural approach. Many of the works are almost monochromatic save for key passages, others are rich with subtle variations in color. His textures combine striations, stipple and linear geometric marks in a way that gives them an appealingly graphic quality. Blimes uses directional marks to aid in the definition of the form and the flow of your eye through the composition. His brush marks also lend a feeling of unity to the surface and give his paintings a feeling of atmosphere. His website features a images of his work that are fortunately reproduced large enough to get some feeling for the textural surface. Daniel Blimes’ work can currently be seen in a solo show at Arcadia Contemporary in Pasadena, CA. The show is titled “Paradigm” and will be on display until April 28, 2019. When my wife and I first arrived in Paris in 2002, evening was descending as we checked into our B&B and it was dark when we went out for our first stoll in Paris. We were staying in the area of the Botanical Gardens, and it was a short walk down to the quay by that part of the Seine. 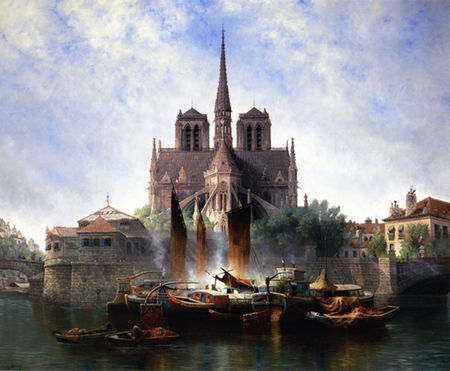 As we rounded a corner where the river bends, we were astonished and delighted with the magnificent sight of the Cathedral of Notre-Dame across the river, brightly lit against the dark of the September Paris sky. It was a moment as indelible in my memory as any can be, tucked away for safekeeping in my mental file of “most treasured memories”. All over the world — and of course, especially in Paris —, others are taking out similar memories of that most beautiful and iconic of Parisian structures, holding them in their mind’s eye and sadly reflecting on the loss of yesterday’s fire. While other structures may come to mind as iconic representations of tourist Paris, it is the cathedral of Notre-Dame that is the architectural heart of that city, both figuratively and quite literally. The city was founded on the island in the middle of the Seine on which the cathedral stands. It is a building so beautiful in its design and execution that is is without doubt a sculpture; and like all great sculpture, it modifies and enriches the experience of the space around it. Notre-Dame de Paris, and views of it from various angles and sections of the city, have been an inspiration for generations of artists. I’ve selected a few of them to view here, — as a reminder the building in its proper glory and hopefully a glimpse of its eventual restoration. You can find more on the Google Art Project. Link is to Wikimedia Commons page with access to high a resolution image. There is also a zoomable version on the Google Art Project. The original is in the collection of The Museum of Fine Arts, Houston. Though he also painted landscapes, seascapes and a variety of still life subjects, 19th century American painter Martin Johnson Heade was known in particular for his paintings of birds and flowers. 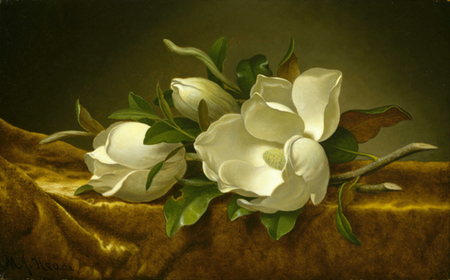 Head did a number of close up, carefully observed paintings of magnolia blossoms, of which this painting is a beautiful example. 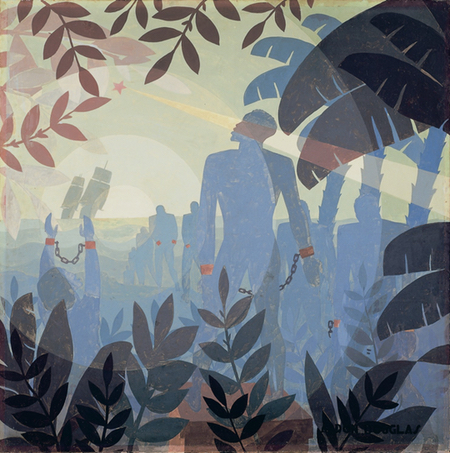 Aaron Douglas was an American painter, illustrator and muralist active in the early to mid 20th century. He was a notable artist among the group collectively identified as the Harlem Renaissance. Much of his work centered on social issues affecting African Americans and often utilized African motifs, as well as Jazz-age imagery and Cubist and Art Deco elements. What I find particularly fascinating about his work is his use of somewhat Cubist geometric forms within his composition. He has nuanced these in value and chroma to give the appearance of overlapping translucent layers. He utilizes them to suggest beams of light, circles of radiance, stars and other patterns that fit into his narrative.